Hall of Famers: Yankees: Wade Boggs, Joe Torre (mgr). Braves: Bobby Cox (mgr), Tom Glavine, Greg Maddux, John Smoltz. The 1996 World Series matched the defending champions Atlanta Braves against the New York Yankees. The Yankees won in six games (despite being outscored 26–18) to capture their first championship since 1978 and their 23rd overall. The Yankees became the third team to win a World Series after dropping Games 1 and 2 at their home stadium, following the Kansas City Royals in 1985 and the New York Mets in 1986. They also became the first team since the Los Angeles Dodgers in 1981 (Yankees lost to that team that year) to win four straight games after dropping the first two. Game 5 was the final game to be played at Atlanta became the only city to host the World Series and the Olympics in the same year and Atlanta-Fulton County Stadium became the only stadium to host baseball in an Olympics and the World Series in the same year. The 1996 World Series marked the beginning of the New York Yankees' dynasty of the late 1990s and early 2000s. However, the dynasty may or may not have happened if there wasn't a strike in 1994, as the Yankees had the best record in the American League then. Despite the rich playoff history of the Yankees, the defending champion Atlanta Braves entered the Series as heavy favorites. The Yankees had reached the Fall Classic after their ALCS victory over the Baltimore Orioles, while the Braves had rallied from a 3–1 deficit to defeat the St. Louis Cardinals in the NLCS. The Braves used the dominant pitching of Greg Maddux and Tom Glavine, as well as timely hitting, to defeat the Indians the year before, and looked to reuse that recipe against the upstart Yankees. In 1996, John Smoltz returned to form, winning 24 games and a Cy Young Award, providing another serious pitching threat for Atlanta. New York brought a lineup mixed with veterans, like Paul O'Neill, and young stars, like rookie Derek Jeter. The Yankees bullpen was also vastly superior to the Atlanta bullpen, which would prove to be the deciding factor in the Series. However, some of the players with the Yankees would not have been there if the strike hadn't taken away their season in 1994. After victory in 1996, New York would go on to win the Series three of the next four years, two of which came against either their cross-town rivals, New York Mets, or the Braves, making their dynasty of the 1990s part of the rivalry between both National League East teams. The Braves, while winning their division every season from 1991 through 2005, have not won a World Series game since Game 2 of this series. Over the course of the 1996 World Series, the Braves hit .315 during the first six innings and .176 afterward. Atlanta had more hits, runs, homers, and a lower team ERA during the course of the series, but still lost, much like the 1960 Yankees' performance against the Pittsburgh Pirates. This is the first World Series to feature the series logo on the side of each team's hats. This was also the last of four consecutive World Series (1992–1996) to be presided over jointly by the presidents of the American and National Leagues in lieu of the Commissioner of Baseball, as Paul Beeston would be named CEO of Major League Baseball for the 1997 Major League Baseball season. Following Game 6, then-American League president Gene Budig presided over the Commissioner's Trophy presentation to the Yankees. Then-Chairman of the Executive Committee Bud Selig, who had presided over the trophy presentations in 1995 and would do so again in 1997, officially became Commissioner in 1998. Game 1 and Game 2 were originally scheduled for Saturday, October 19 and Sunday, October 20, respectively. Rain on October 19, however, washed out Game 1. The schedule was moved up one day, with Game 1 and Game 2 rescheduled for October 20 and 21, and the Monday travel day eliminated. This was the last rain out in a World Series game until Game 4 of the 2006 World Series. This was the first rain out in a World Series game since Game 7 of the 1986 World Series, which happened across town at Shea Stadium during the Mets' championship season when they played the Boston Red Sox, whom Wade Boggs was with at that time. The Braves, who had won the last three games of the NLCS by a combined score of 32–1, continued their roll early in the Fall Classic. In the second inning of Game 1, rookie center fielder Andruw Jones became the youngest player, 19, in World Series history to hit a home run. He went deep to left again off Brian Boehringer during a six-run third inning for the Braves. Jones surpassed Yankee great Mickey Mantle on what would have been Mantle's 65th birthday (Mantle died in 1995). Also during Game 1, Andruw Jones became only the second player in World Series history (after Gene Tenace in 1972), and youngest ever, to hit a home run his first two times up in a Series. A Fred McGriff home run off the foul pole in the fifth left Atlanta ahead 9–0. Jones had his third hit and scored in Atlanta's three-run sixth. Braves starter John Smoltz would pitch six easy innings before turning it over to the bullpen in Atlanta's 12–1 rout, while Yankees starter Andy Pettitte did not last a full three innings. After showcasing their big bats in Game 1, the Braves used the dominant pitching of Greg Maddux to win Game 2. Fred McGriff, who went two for three with a sacrifice fly, had single RBIs in the first, third, and fifth innings, while Marquis Grissom added a run-scoring single in the sixth. This was more than enough for Maddux, who pitched a gem, scattering six hits in eight innings. Mark Wohlers pitched the ninth to combine with Maddux on the 4–0 shutout. With the Braves holding a 2–0 lead in the Series as it headed to Atlanta, they appeared on the brink of a championship repeat. The Braves beating the Yankees in the first two games by a combined score of 16–1 was the biggest run differential in World Series history. New York starter Jimmy Key lost his first World Series decision in three appearances, his first two coming in the 1992 World Series. After Game 2, Atlanta and then bringing the series back to Yankee Stadium to clinch at home. Steinbrenner doubted Torre, saying, "If you guys can't beat the Braves at home, you surely can't beat them down in Atlanta." The Yankees needed a solid performance from David Cone, (who had been expected to miss the entire year after having mid-season surgery for an aneurysm in his pitching shoulder) and got one, with him pitching six innings and only giving up one run. Tom Glavine also turned in a fine start for the Braves, pitching seven innings giving up two runs, only one of them earned. With New York clinging to a 2–1 lead in the eighth, Bernie Williams, who had two RBIs in the game, launched a two-run homer off Braves reliever Greg McMichael, which effectively put the game out of reach. The Braves were able to get a run off Yankee Mariano Rivera, but closer John Wetteland pitched a perfect ninth to shut down Atlanta. With the Game 1 rainout, both the Braves and Yankees were forced to alter their pitching rotation. Atlanta started midseason acquisition Denny Neagle while New York countered with Kenny Rogers, the only other starter the Yankees had on their postseason roster and who had been largely ineffective during the season. Rogers was hit early and often, and failed to make it out of the third inning. In the bottom of the second Fred McGriff led off with a solo home run to open the scoring. After Javy Lopez and Andruw Jones walked, Jermaine Dye sacrificed Lopez to third. Jeff Blauser followed with a bunt single to score Lopez, and after Neagle bunted to advance Jones and Blauser Marquis Grissom doubled them in to give Atlanta an early 4–0 lead. Rogers was pulled after allowing Chipper Jones and McGriff to reach base to begin the third, and was charged with a fifth run when Brian Boehringer gave up a sacrifice fly to Lopez which enabled Jones to score. The Braves extended their lead to 6–0 as Andruw Jones drove in Chipper Jones with a double in the fifth off David Weathers. Meanwhile, Neagle was pitching shutout ball and the Yankees had only gotten two hits through five innings. The sixth inning, however, proved to be troublesome. Derek Jeter led off and hit a foul pop near first base. As McGriff and Mark Lemke chased the ball from the infield, right fielder Dye came in and had the best chance to get the ball. However, umpire Tim Welke had his back to Dye and inadvertently blocked him from getting to the ball, causing it to simply drop foul. Jeter promptly singled to start a three run rally, capped by a Dye error in right on a Cecil Fielder single that allowed two runs to score. After Charlie Hayes drove in Fielder, Neagle was pulled in favor of reliever Terrell Wade, who walked Darryl Strawberry and was promptly pulled in favor of Mike Bielecki, who struck out the next three batters and then retired the Yankees in the seventh. Bielecki retired six of the seven batters he faced, striking out four total. Although the Braves were still leading, the deficit had been cut in half and a decision by Braves manager Bobby Cox proved a critical mistake. Cox elected to bring in closer Mark Wohlers for a potential two-inning save against the bottom third of the Yankee order in the eighth. Charlie Hayes led off the inning with a dribbler down the third base line that stayed fair and Darryl Strawberry followed that up with a line drive single to left. After Mariano Duncan grounded into a fielder's choice to take Strawberry off the bases, backup catcher Jim Leyritz came to the plate for his first at bat of the night. With a 2–2 count on him, Leyritz jumped on a Wohlers slider and hit it over the left field wall to tie the game. Both teams found trouble in the ninth inning. After recording the first two outs Wohlers gave up back to back singles to Fielder and Hayes in the top half and then gave up an infield hit to Strawberry which loaded the bases. However, he got out of the jam when Duncan hit a short fly ball to Dye. Mariano Rivera, pitching his second inning, got into his own trouble in the bottom half when he allowed a single to Lemke and a walk to Chipper Jones. With lefthander McGriff due up, and as he had done the previous night when Rivera struggled, Joe Torre called on Graeme Lloyd to get McGriff out. Lloyd did precisely that, forcing him to ground into an inning-ending double play. The Braves sent Steve Avery, who had been largely ineffective as a starter over the previous few seasons, to the mound for the top of the tenth. After getting the first two outs of the inning Avery walked Tim Raines and gave up a single to Jeter. Bernie Williams then drew an intentional walk to load the bases so Avery could pitch to Andy Fox. The Yankees countered by pinch hitting Wade Boggs, whom Avery walked. Now trailing 7–6, Cox pulled Avery in favor of Brad Clontz and brought Ryan Klesko in as a defensive replacement for McGriff at first. This led to the eighth and final run for the Yankees as Clontz got Hayes to pop up but Klesko lost sight of the ball and it fell in to score Jeter. After Lloyd retired Klesko to lead off the bottom of the tenth, John Wetteland came in and recorded the final two outs, the last of which was a fly ball off the bat of Terry Pendleton. The 8–6 victory for the Yankees evened the Series at two wins apiece. "It was our game to win and we had our chances," Avery said. "I ended up costing us the game." This was the second biggest comeback in World Series history. The 1929 Philadelphia Athletics scored ten runs in the seventh inning to defeat the Chicago Cubs 10–8 in Game 4. With the Series tied at two apiece, John Smoltz and Andy Pettitte faced off in a pitcher's duel in the final game ever at Atlanta-Fulton County Stadium and gave up a total of zero earned runs in the combined 16 1⁄3 they pitched. The lone run of the game was scored in the top half of the fourth inning. Charlie Hayes hit a deep fly ball to center that Marquis Grissom appeared to have, but at the last second Jermaine Dye crossed in front of him and Grissom dropped the ball. Hayes advanced to second on the error, moved to third on a groundout by Bernie Williams, and scored on a double by Cecil Fielder. Entering the sixth inning Pettitte had only allowed one hit, but Atlanta threatened. Smoltz led off the inning with a single and was followed by a Grissom single. With Mark Lemke batting the Braves called for a sacrifice bunt, but Pettitte fielded the ball and threw out Smoltz at third. The next batter, Chipper Jones, hit a ground ball right back to Pettitte, who started a double play to end the inning. As the top of the ninth inning played out, Pettitte was due up fifth. Mark Wohlers gave up a walk to Paul O'Neill and had intentionally walked Jim Leyritz to bring up the pitcher's spot with two out. Pettitte then strode to the plate, making it clear that he was going to pitch the ninth. Wohlers retired Pettitte with a flyout to left field. The Braves made a final attempt to tie in the bottom of the ninth. Chipper Jones led off with a base hit and was able to stretch it into a double. Yankee manager Joe Torre pulled Pettitte from the game in favor of closer John Wetteland after Fred McGriff grounded out to second. With the tying run at third, Wetteland recorded the second out as Javy Lopez grounded out. He then walked pinch hitter Ryan Klesko intentionally to pitch to Dye. Braves manager Bobby Cox countered by pinch hitting Luis Polonia, who fouled off seven pitches before lifting a fly ball to deep right field. O'Neill, coached by first base coach Jose Cardenal, had moved several steps towards center field and in spite of having played with injured legs for most of the series, ran the ball down and caught it to end the game and give New York the series lead. The loss suffered by Smoltz was his first in seven career World Series starts (Smoltz's record was 2–0 entering the game with four no-decisions). The Yankees became the first team to sweep the middle three games of the World Series since the Braves themselves did it in 1991 (although the Braves won all three games at Fulton County Stadium in the 1991 Series; the home team won all seven games of that series). Through 2015, the 1996 Yankees are the last team to win all three middle games of the series on the road. Prior to this series, the last team to pull that off were the Baltimore Orioles in 1983 at Philadelphia. The Braves joined the 1905 Philadelphia Athletics, the 1921 New York Yankees and the 1986 World Series champion New York Mets as the only teams to lose a 1–0 World Series game on an unearned run. Prior to Game 6, Yankees manager Joe Torre's brother Frank underwent heart transplant surgery. The Yankees, seeking to clinch their first world championship since 1978 and the first for a New York City baseball team since the Mets won in 1986, faced off against Greg Maddux in a rematch of the Game 2 starters, as Jimmy Key took to the hill for the Yankees. The Braves, for the third time in their four World Series visits thus far in the 1990s, were facing an elimination game. The Yankees struck against Maddux in the bottom of the third inning. Paul O'Neill led off the frame with a double and advanced to third on a groundout by Mariano Duncan. Joe Girardi then hit a flyball to center field that Marquis Grissom misjudged, which scored O'Neill and gave Girardi a triple. He scored on a single by Derek Jeter, and after stealing second Jeter scored on a single by Bernie Williams. These were the only three runs Maddux gave up in the series, but they were costly. Maddux pitched the next 4 2⁄3 innings without giving up another run. The Braves got a run back in the top of the fourth as Fred McGriff reached on a walk. Javy Lopez and Andruw Jones followed with back to back singles to load the bases, and Jermaine Dye drew a walk to force in the run. Key got out of the bases loaded jam by getting designated hitter Terry Pendleton to ground into a double play to end the inning. New York manager Joe Torre pulled Key from the game in the top of the sixth with one out and Chipper Jones on third. David Weathers came in to pitch to Lopez and retired him. Then after a walk to Andruw Jones and Ryan Klesko coming in to pinch hit for Dye the Yankees went to Graeme Lloyd to pitch to Klesko, who did not have a hit against Lloyd in the series. Lloyd retired Klesko to end the inning and Mariano Rivera got the next six outs to send the game to the ninth. Maddux came out of the game one out away from a complete game in the eighth, and Mark Wohlers retired Cecil Fielder to end it. John Wetteland was called on again for his fourth save of the series, but the Braves tried to rally. After he struck out Andruw Jones to lead off the inning, Klesko and Pendleton got back to back singles off of Wetteland. With one out and runners at the corners, Luis Polonia came off the bench to pinch hit for Jeff Blauser, but failed to produce a hit and struck out swinging. Grissom then followed with another single, scoring Klesko and giving the Braves at least one more chance with Lemke at the plate. However, Lemke simply popped out to Charlie Hayes in foul territory and the game and Atlanta's reign as world champions was over. Wetteland became the second pitcher to record four saves in a single postseason series, following Dennis Eckersley's feat in the 1988 ALCS and since matched by Greg Holland in the 2014 ALCS. The Braves would make, to date, one World Series appearance after moving into Turner Field, and that took place in 1999, when they again met the Yankees and lost (as noted above, the Yankees dynasty of the 1990s was part of the Braves heated rivalry with the Mets). For the Yankees, it took their manager Joe Torre 4,272 games to get to the World Series as a player or manager, the biggest drought for any player or manager in the history of Major League Baseball. Also, although the World Series win ended the longest drought in team history, the team, like baseball itself, was still reeling from the player's strike two years before and the fallout from it. The strike resulted in many lost opportunities, as they had the best record in the American League that year and many members of the 1994 team were not there in 1996. Buck Showalter, who was the Yankees manager in 1994, could not watch the World Series because of how he felt in 1994 when the strike ended the Yankees championship hopes. He said of 1994: "That sits in my craw a little bit. It's not something you can go back and rectify. I feel badly for the fans." This was the first World Series to be televised by the Fox Broadcasting Company. Fox's play-by-play man Joe Buck became the second youngest person (at the age of 27) to broadcast a World Series. Vin Scully, who this year called the World Series over CBS Radio Sports, is still the youngest at 25, when he called the 1953 World Series for NBC television. Buck however, became the youngest person to ever broadcast all nine innings of a World Series while being a full-time network employee (surpassing CBS' Sean McDonough, who was 30 years of age when he called the 1992 World Series). In 1953, Vin Scully split play-by-play duties with Mel Allen. Also, the network television policy back then, allowed announcers representing the participating World Series teams (in the case of 1953, Vin Scully's Brooklyn Dodgers and Mel Allen's New York Yankees) to call the action. During Game 6 at Yankee Stadium, a fan behind home plate held up a sign that said "John 3:16". Tim McCarver made mention of this sign, saying that the fan was a true Yankees fan because he knew Tommy John's career ERA. John's career ERA is actually 3.34, not 3.16. 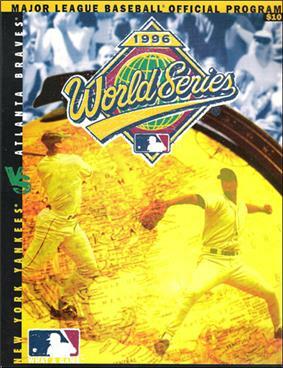 On October 11, 2005, A&E Home Video released the New York Yankees Fall Classic Collectors Edition (1996–2001) DVD set, featuring one World Series Game from 1996, 1998, 1999, 2000, 2001. Game 4 from the 1996 World Series is included in the set. On September 23, 2008, The Essential Games of Yankee Stadium DVD set was released, featuring six games that were played in Yankee Stadium, were determined via fan voting. Game 6 of the 1996 Series is included in this set. ^ a b Costello, Brian (August 8, 2004). "'94 Yanks Cut Short". ^ a b The subway series: the Yankees, the Mets and a season to remember. St. Louis, Mo. : The Sporting News. 2000. ^ "1996 World Series Game 1 - Atlanta Braves vs. New York Yankees". Retrosheet. Retrieved September 13, 2009. ^ "1996 World Series Game 2 - Atlanta Braves vs. New York Yankees". Retrosheet. Retrieved September 13, 2009. ^ "1996 World Series Game 3 - New York Yankees vs. Atlanta Braves". Retrosheet. Retrieved September 13, 2009. ^ "1996 World Series Game 4 - New York Yankees vs. Atlanta Braves". Retrosheet. Retrieved September 13, 2009. ^ "1996 World Series Game 5 - New York Yankees vs. Atlanta Braves". Retrosheet. Retrieved September 13, 2009. ^ "1996 World Series Game 6 - Atlanta Braves vs. New York Yankees". Retrosheet. Retrieved September 13, 2009. ^ "Puckett receives Clemente award". USA Today. October 24, 1996. p. 5C. History of the World Series - 1996 at The SportingNews. Archived from the original on 2008.